On March 22nd 2008 during the late afternoon an extensive sheet of intricate white cirrus cloud arrived in from the north and produced segments of a halo around the Sun. It looked promising so I walked one mile into the countryside for a better view. 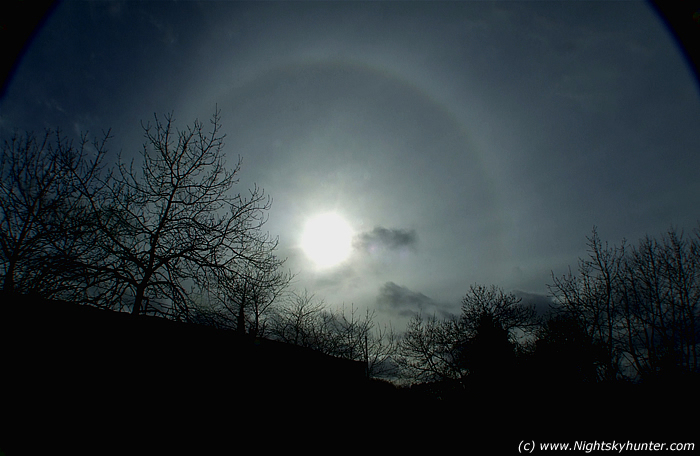 The halo quickly intensified and formed a near complete 22 degree ring around the lowering Spring Sun. The very bottom of the halo was either on the horizon or below it. The main section was very bright with eye catching yellow and white colours, on closer inspection other colours could be seen. Deep orange and red on the inside and blue on the outer ring and even green (probably a contrast effect). I took many images before darker thicker cloud arrived in and obscured the show. Here the halo is in the west above an old stone bridge, in the past a railway line used to pass under it but now it's just a marsh narrow valley surrounded by fields and sheep on either side. This was taken with the 58mm wide angle lens hence the shadows at the corners. ISO100, 2000/sec at F/8.1. Quite a nice halo for the Easter weekend!.